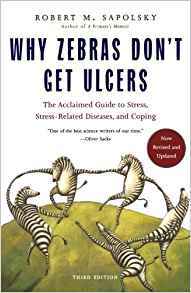 Book Review – “Why Zebras Don’t Get Ulcers” by Robert Sopolsky. WOW, this is some read, I read the third edition of this and it has been substantially revised. Sopolsky is an incredibly interesting person himself and as a professor of neurology and a primatologist he occupies a unique position in academia. Make no mistake I am a huge fan of his work, I have his new book ‘Behave’ sat waiting to be read. Written with an interesting sense of humour this book introduces the reader to some incredibly interesting medical research and practise. I have been using certain items from this book into my teaching and cortocorticoids is now my new favourite word. The emphasis is on stress and there is a wealth of information on how the body and in particular the brain reacts to stressors. Trust me and go get this book, work through it slowly one chapter at a time. Take weeks not days to read it, let the information seep into your subconscious. As I worked my way through the chapters I could see my friends and family and some of their problems appearing from within the pages. Frighteningly I recognised a few things about myself and how I deal with, react to stressors, trust me I learned some valuable lessons and will modify some of my behaviour as a result. As I write this review there is a radio debate in the background on the health effects of poverty and the discussion is almost word for word out of this book. I highly recommend this book, it is an incredibly enlightening read.